Fiat Chrysler discovered the coupling problem in some Ram 1500 EcoDiesel pickups in December at the Warren, Mich., truck plant. DETROIT -- Fiat Chrysler is replacing a potentially faulty exhaust coupling in the hot-selling Ram 1500 EcoDiesel pickup that can send diesel fumes into the cabin through the air conditioner. The coupling is between the engine's exhaust manifolds and the catalytic converter. FCA US is not recalling the Ram EcoDiesel, spokesman Eric Mayne said, but the company is notifying owners of the problem. It has caused no accidents or injuries, Mayne added, and it is not a safety recall issue. "The level of fumes in the vehicle is well under what OSHA [Occupational Safety and Health Administration] considers a problem, so we ruled out a safety problem first," he said. Affected pickups are 4x2s from the 2014 and 2015 model years, Mayne said. He said the problem was discovered in December at the Warren, Mich., truck plant. Engineers traced the problem to a vibration specific to the 4x2 version that can cause the coupling to crack and leak exhaust fumes. Mayne said dealers will replace the part with an identical coupling temporarily, and replace the repair part when a more robust replacement becomes available. He said this will allow Ram drivers to use their trucks. The automaker declined to say how many Ram owners have experienced the problem or how many pickups are affected. The EcoDiesel engine accounts for about 20 percent of total Ram 1500 sales and has been a hot seller, due in part to its best-in-class 29 mpg highway fuel economy rating. 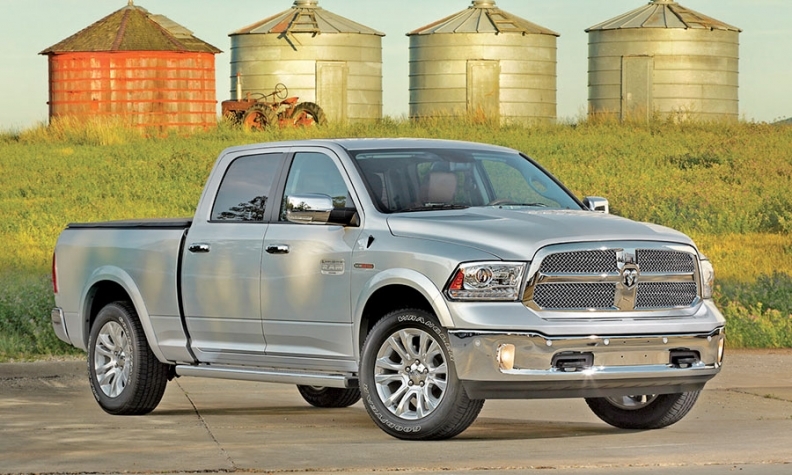 No other automaker offers a light-duty pickup with a diesel engine in the United States. Nissan plans to launch a diesel-powered Titan in the fall. Said Mayne: "We know who all these customers are and where they are. We are going to reach out to them and provide them an opportunity to have the repair whether or not they've had the problem."